Super Smash Bros. Ultimate, Nintendo's final major title for the 2018 holiday season, draws entirely on the single most valuable asset in the company's arsenal: Its vast stable of characters. The "Ultimate" in "Super Smash Bros. Ultimate" refers to the fact that producer Masahiro Sakurai has managed to roll the character rosters of all four previous Smash Bros. entries—a series nearly 20 years old—into this single release. Smash Ultimate is, in many respects, an exercise in bragging about numbers. Players can choose to fight in one of 100 different arenas, accompanied by hundreds of remixes of classic video game music, unlocking more than a thousand different gameplay-modifying "Spirits" in the process. The sheer volume of material to earn and trainspot effectively ensures that even the most obsessive Smash Ultimate player will never truly see everything contained within through normal play. The most important number here, however, is 75. That's the official number of characters Nintendo currently has announced as playable fighters in Smash Ultimate, including downloadable brawlers, four of whom have yet to be revealed. 75 is more than six times the number of characters to have appeared in the original Super Smash Bros. for Nintendo 64 back in 1999, where a dozen of the company's icons let fans around the world duke it out for dorm room dominance. That's remarkable growth, even within a genre where every series' character select screens grows more crowded and illegible with each new iteration. Of the nearly six dozen known characters appearing as playable participants in Smash Ultimate, a full 60 of them hail from properties owned either in full or in part by Nintendo. The roster encompasses both juggernaut mascots like Mario and Pikachu as well as esoteric selections like Lucas (star of Mother 3, a role-playing game never localized for the U.S. or Europe) and Mr. Game & Watch (a made-up melange of references to the Game & Watch LCD handhelds of the early ’80s). No doubt the fighting game community will manage to hammer together the guidelines to mold some aspect of Smash into a fighting game suitable for competition, but the sheer size of the roster—not to mention the fact that every fighter can be modified to extreme degrees with those aforementioned thousand-plus unlockable Spirits—means that, in its default state, Smash is almost certain to rank among the least-balanced fighting games ever. The real point of Smash Ultimate isn't to present a professional-grade competitive game. Rather, it's a celebration of Nintendo, by Nintendo. The draw for Nintendo fans lies in the novelty of throwing a bunch of their favorite video game protagonists together and seeing what happens—a huge, chaotic, video game toy box. That concept has been reduced subtext for Smash Ultimate, but it was more explicit in the original N64 release. In that game, players didn't control actual Nintendo heroes and heroines but rather took command of toy versions of those characters. Nintendo (along with N64 Smash developer HAL) spoke directly to their fans' childhood desire to reach into a toy box full of video game action figures and, well, smash them together. Though this metatext was retired for the sequels, toys do still factor heavily into the Smash experience. Only now, those toys take literal physical form by way of amiibo figurines, which allow players to power up their fighters by tapping a toy to the Switch console's NFC sensor. The original Smash presented fighters-as-toys, and amiibo invert this. Now we have toys-as-fighters. Either way, all of this speaks to Nintendo's unique strength and greatest asset: Its enormous roster of franchises, worlds, and characters. Even without the 11 fighters appearing on loan from licensees like Konami, Capcom, and Sega, and Smash Ultimate would still have arguably the biggest, most diverse roster of instantly recognizable characters in all of video games. Nintendo is keenly aware of the importance of its characters. When the company's leaders have outlined their key strategies for the company's future in recent years, the fulcrum of their tactics inevitably pivots on these intellectual properties. "By using Nintendo IP in a variety of other ways, such as licensing and commercializing this IP for visual content and merchandizing products, we are planning to maximize the value of Nintendo IP, which has traditionally been used mainly for our dedicated video game systems," former president Tatsumi Kimishima said back in 2015. 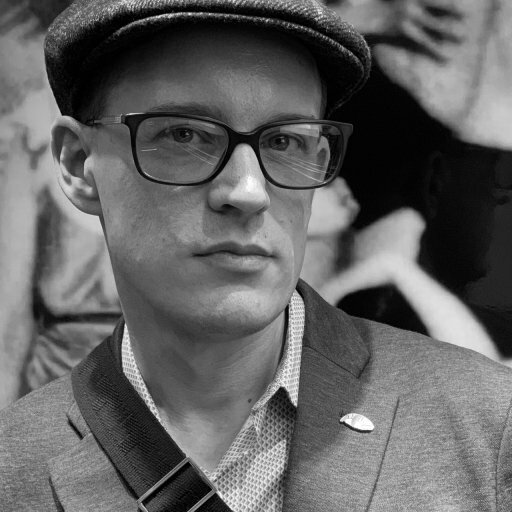 His sentiments were echoed by his successor a year later, when current president Shuntaro Furukawa outlined his desire to "expand the number of people who have access to Nintendo IP.... We want more people to have access to the characters and worlds from games created by Nintendo, and thereby raise the corporate value of our business." Nintendo's determination to export its character roster beyond the confines of video games was born of necessity, of course. At the time those plans were hatched, the company's console business was at an all-time nadir as the Wii U established itself as the company's worst-performing console ever. Switch has reversed those sagging fortunes, but Nintendo's diversification plans were already in motion by the time that new platform proved its mettle. Even so, those expansion efforts don't seem out of character for the company. Nor are they far removed from the philosophy that permeates Smash Ultimate: In the end, it's all about the characters. Two years ago, Nintendo announced its own Universal theme park, which the company described as "stepping into a larger-than-life Nintendo adventure. Gigantic Piranha Plants spring to life. Question blocks, power-ups and more surround you. And Mario and all his friends are there to pull you into a brand-new world." Mario iconography has become pervasive enough that Nintendo can paint a vision in people's minds with words alone, and it's no coincidence that Mario appears front-and center in most Super Smash Bros. artwork and promotional material. Even the series' title evokes Mario's breakout hit for NES, Super Mario Bros. He’s not only Nintendo’s mascot, but also the platonic ideal of their approach to character management. Writing for The Atlantic, Will Partin claimed that "The 'secret' to Mario’s popularity lies in his profound average-ness, which allows him to easily adapt to virtually any context. More than once, I’ve heard Mario referred to as a video-game 'Ur-Symbol.'" And yet the objects Nintendo described in its Universal announcement are anything but generic; red-spotted carnivorous plants and mushroom-belching boxes emblazoned with question marks are highly specific images. Even Mario is a distinctive figure. A slightly rotund mustachioed workman sporting bright primary colors only reads to players as a normal video game character concept because of Mario’s towering success. Like The Beatles or Seinfeld, Mario's popularity has turned something remarkable into the mundane. Smash Ultimate plays up the contradictory weirdness and predictability embodied by Mario to highlight the rest of its extensive character stable. 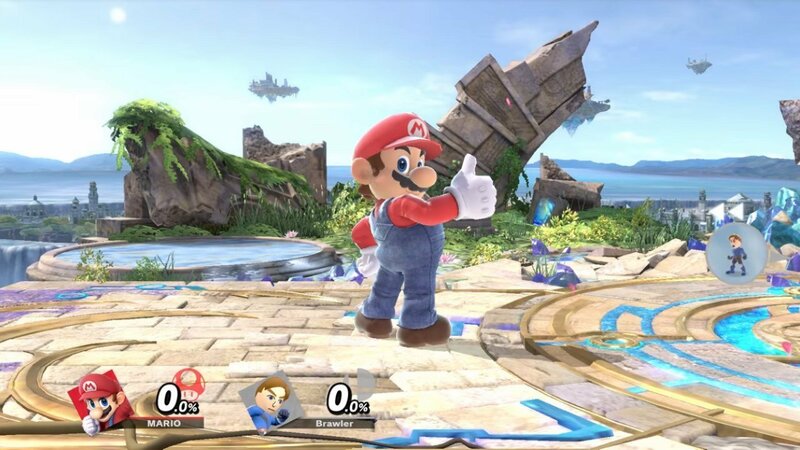 As suggested by Partin, if Mario is indeed the default of video games (at least in the family-friendly corner of games embodied by Nintendo), everyone else in Smash Ultimate exists in contrast. Indeed, the six dozen fighters on offer here look utterly incongruous when they share the same virtual space. The relatively realistic proportions of Xenoblade's Shulk, for example, render the cartoon neoteny of Animal Crossing's Isabelle ludicrous by comparison. Somehow, though, this ends up not mattering, because Mario—at once human and uncanny—unifies them. Mario also serves as an anchor into the historic depth of the game, which at its greatest extreme actually reaches back to works that predate Mario's 1981 arcade debut. Having been a participant and a witness to nearly 40 years of video game evolution, Mario here serves as a reminder of the original context for all these combative cartoons. Consider the muscular, stubble-chinned military operative Solid Snake, a guest character defined by his utility. Snake's Nintendo debut—the 1988 NES port of Metal Gear— was sold entirely on Snake's versatility: That game's ad campaign consisted of a chart depicting the numerous weapons and tools players (as Snake) needed to master in order to complete the adventure. Yet Smash Ultimate posits that this character can compete as an even match to Namco's iconic Pac-Man, a character whose physical form here isn't too far removed from the featureless circle who rocketed to fame nearly a decade before Snake's debut. Not only do Snake and Pac-Man look preposterous together, they're wildly mismatched in terms of the game verbs associated with them. In his adventures, Snake can run, crawl, shoot, eat, carry, hide, climb, throw, examine, open, parachute, radio, roll, choke, wear, and punch. Pac-Man can only move and devour. And yet, Smash cheekily throws this mismatched duo together—and it works. On top of that, the historic curios that litter Smash Ultimate serve to demonstrate the fact that Snake and Pac-Man ultimately aren't so far removed from one another. After all, Snake's adventures took the form of top-down stealth action games that owe a tremendous debt to Pac-Man's classic arcade maze-chases. A recurring criticism of the first few Metal Gear Solid games was that their inclusion of on-screen radar mini-map caused their complex military settings—Alaskan bases and Atlantic oil refineries—to degenerate into little more than simplified Pac-Man sessions. Despite sharing so little in common, the characters of Smash find unity not in their aesthetics but rather through their shared histories and common thread of video game evolution that links them. It's possible for players to enjoy Smash Ultimate entirely on a surface level, without knowing or caring about the history or design concepts lurking in the background. Yet the game works as well as it does because its creators care deeply about these things. Nintendo alone of all publishers recognizes that these characters and the games that introduced them can be valuable assets when treated with care. Certainly the company is guilty at times of treating its properties too preciously. Consider the steep prices that dated or little-loved Virtual Console releases like Urban Champion and Donkey Kong Jr. Math still command on Wii U. Consider the drip feed of classic games—three per month—appearing as bonus releases on Nintendo Switch Online. Look at Nintendo's history of leading the legal charge against sites specializing in illegal ROM distribution and bootlegged products. Justified or not, such habits often come across to the gaming public as excessively proud, painfully out of touch, or perhaps simply greedy. On the flip side, however, Nintendo seems to be the only company capable of repackaging its history in a compelling manner. Compare the warm reception that greeted the NES and Super NES Classic Edition mini-consoles to the negativity surrounding Sony's PlayStation Classic and Sega's Genesis reproduction systems. Likewise, it's hard to imagine another company striking gold like Nintendo has with its recent Pokémon Let's Go Pikachu and Let's Go Eevee. Despite being the second comprehensive remake effort for Pokémon’s first-generation titles, the Let's Go duology debuted as the fastest-selling releases to date for the Switch juggernaut. Did they succeed because they're great games, or did they succeed because Nintendo has been so canny at maintaining a certain mystique and enthusiasm surrounding them? The answer, ultimately, is both. Nintendo creates and publishes excellent games, then treats them accordingly. You rarely see a Nintendo first-party release slashed to half-price within weeks of release as happens with many other publishers' biggest releases. Some of that comes down to the company's profound conservatism and obsession with control; from the very beginning of its time in the console business, Nintendo has sought to maintain a tight grip on every step of the manufacturing and distribution process. Its habit of distributing critical products in numbers that fall short of demand was most recently seen with the NES Classic Edition, but it dates back into the ’80s. Not only does the buzz that accompanies the scarcity of in-demand goods further fuel demand and anticipation, it also guarantees you won't come across a bin of unwanted Nintendo overstock burdened with multiple markdown stickers. Sometimes, of course, Nintendo miscalculates, and the illusion behind their magic tricks is revealed. For instance, the amiibo line was a must-have gift at its 2014 debut. Yet we discovered the amiibo concept alone isn't a guaranteed seller two years later, when the line expanded to encompass a huge array of minor characters from Animal Crossing. 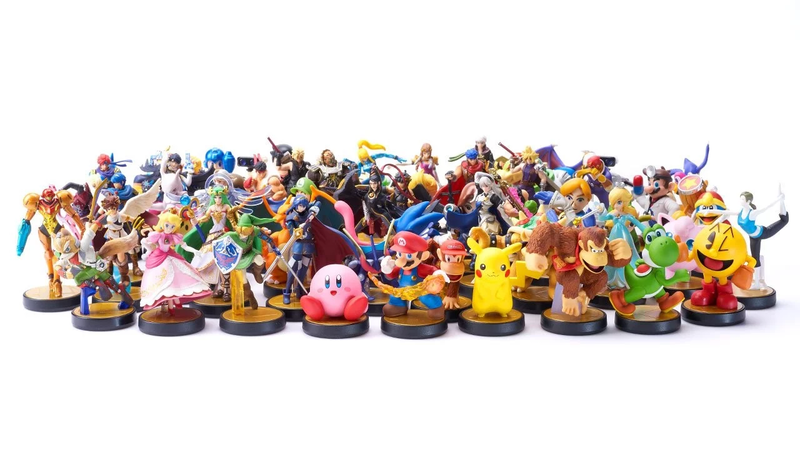 The same retailers who struggled to keep amiibo versions of popular Super Smash Bros. combatants in stock found the likes of Rover and Kapp’n languishing on shelves, right alongside discontinued toys-to-life lines like Skylanders and Disney Infinity. That's not the look Nintendo normally angles for. Such missteps don't happen often, though, and as such Smash Ultimate may hold a wholly unique place in gaming. Since the debut of the original Super Smash Bros., other publishers have attempted to reproduce the series' success with their own character rosters. From Konami's bizarre DreamMix TV World Fighters to Sony's PlayStation All-Stars Battle Royale, none have come close to matching the popularity or critical acclaim of Smash Bros. Tellingly, none of these rival titles offered rosters on par with any of the latter-day Smash Bros. titles, which speaks to the impressive breadth of Nintendo's character franchises. But none of them were as well-crafted as Smash Bros., either. And it's in the combination of these factors that Smash Bros. embodies the very factors that have allowed it to enjoy its one-of-a-kind standing: Nintendo's long-standing determination to create appealing characters, place them in well-crafted games, then jealously protect their value. In some respects—including its name—Smash Ultimate appears to have been positioned as a conclusion of some sort for the series. Yet it's difficult to imagine Nintendo won't revisit Smash Bros. further down the road, especially in light of the company’s commitment to pushing its characters beyond video games and into ventures like film and theme parks. Assuming it approaches these licensing efforts with the same care it has its games, those characters and properties can only become more popular. And that means the Smash games, which bring them all together, would have nowhere to go but up.